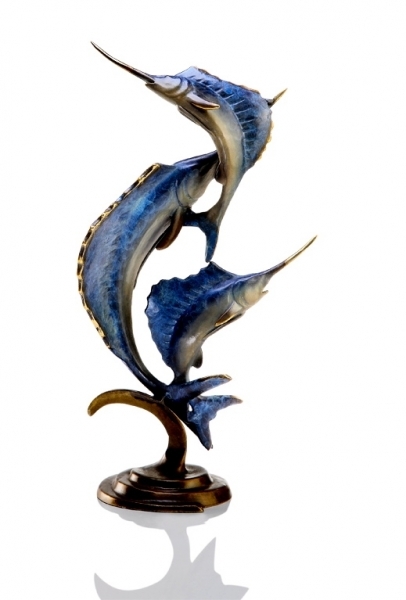 This contemporary and stunning Marlin & Sailfish Sculpture is a great accent to any room in your home or office. From the Prossimo (meaning "next") Collection, this piece starts as an elegant yet understated sculpture, beautiful in its simplicity. Cast in brass using the lost wax technique, the same method used in casting fine jewelry, for unparalleled dimensional detail. After crafting this stylish piece to an entirely smooth work of art, many layers of hot patina are applied giving the sculpt a richness and depth that cannot be duplicated by any other technique. Last, broad areas of the sculpture are deeply polished by hand to bring out the beautiful highlights of golden brass. Truly a work of art, every collector will want to add this piece to their collection. Makes a great gift item for your family, friends, loved ones, or even yourself.